Displaying 1 - 43 of 43 items found. You'll make a stylish splash in the kitchen on Thanksgiving Day when you wear this marvelous acorn apron! Size: Apron front waistband: 20". Apron length: 17". Apron width at base of skirt: 80". This whimsical cornucopia's creativity and colors beautifully reflect autumn's bounty. This e-Pattern was originally published in Holiday Celebrations in Crochet. Size: Cornucopia: 9 x 11 1/2". Fruits and Vegetables: 3 1/2" to 5". Made with medium (worsted) weight yarn and sizes H (5mm) and G (4mm) hooks. Put this spooky little spider in any room to add to your holiday decorations! Size: Spider: 9" long not including legs. Web: 21" across. This Halloween Angel makes a great party favor and is a great choice for trick-or-treaters. Size: 4 1/2" tall. Crochet this beautiful centerpiece for your Thanksgiving table. Size: Cornucopia: 6" x 9" long. Create a festive, fall wreath with this easy crochet pattern. The friendly scarecrow will greet your guests with charm. Finished size: 9 1/2" in diameter. This festive centerpiece will be the talk of your next Halloween party! Size: 3", 5" and 7". Made with size 10 crochet cotton thread and size 1 (2.25mm) steel hook. Beware, this kitty has eyes that can glow in the dark. Size: Cover: 5" tall scalloped edge bowl. Doily: 7 1/2" across. Decorate your home with these Halloween cozies for that scary night! Size: 4" tall x 2 1/2" diameter each. Decorate your home with these Halloween accessories! Size: Basket: 9" wide x 4" high. Trick or Treat Bag: 10" wide x 11" high. Hot Pad: 9" square. Potholders: 7 1/2" square. Create an attractive tote using the new Crochet 'n' Weave technique. This crochet handbag pattern is easy! Size: About 8" wide x 9" high x 3 1/2" thick after weaving, plus handles. Create an assortment of whimsical quick-to-stitch favors for trick-or-treat tuck-ins! Size: Ghostly Pencil Cover: 3 1/2" tall. Spooky Cat Pin: 4 1/2" tall. Crochet a special toy for a little one this autumn with this easy free crochet pattern. A bright orange, crochet pumpkin serves as the teddy bear's body. Size: Sits 6 1/2" tall. Delightful Halloween pineapple doily is stitched with size 10 thread and size 8 hook. Size: 22" diameter. Keep your house haunted this Holiday Season with a crazy pumpkin patch pillow. Size: 11" x 12". Crochet this pumpkin for your Thanksgiving kitchen. Size: 6 1/2" x 7". Easily found craft pumpkins were used in the design of our wonderful Thanksgiving harvest centerpiece -- a delightful scarecrow! Size: 12" tall. This crochet cover using size 10 crochet thread. Size: fits over a 9" tall brandy glass. Bats, pumpkins and ghosts can dance from your rafters with this adorable garland! It's a quick and easy project that adds flair to your Halloween Party. Finished Size: Ghost: 2 inches tall. Pumpkin: 1 5/8 inches across x 2 inches tall. Bat: 4 1/4 inches across x 2 1/2 inch tall. Sunflowers say summer! Join 12 sunflower motifs to complete this pretty gusseted crochet purse pattern. Fully lined, zippered bag is worked with two strands size 5 crochet cotton and one strand metallic blending filament using a size D/3 crochet hook. Size: 6 1/2" x 9 3/4". Celebrate the fall harvest and Thanksgiving by crocheting this earth-tone gem. This e-pattern was originally published in the October 2009 issue of Crochet World magazine. Size: 42" x 64 1/2", excluding fringe. Made with medium (worsted) weight yarn and size J (6mm) hook. Miniature craft apples complement the 4-ply veggies in this creative cornucopia centerpiece. Size: 14" long. Long and fluid, this lacy filet crochet accessory drapes beautifully over your dressiest outfits. Stitch the basic geometric pattern from the easy-to-follow chart provided, and finish with a lush fringe. 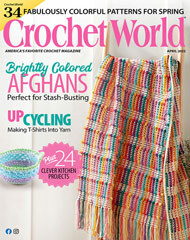 This e-pattern was originally published in the October 2010 issue of Crochet World magazine. Size: 8 3/4" x 84", excluding fringe. Made with size 3 crochet cotton thread and size C (2.75mm) hook. Add some fun to your fall decor with these crochet tissue box covers. You'll love the friendly spiders on the Halloween tissue box cover and the whimsical turkey on the Thanksgiving cover. Size: fit a boutique-style tissue box. Crochet candy-corn accents to use as festive, Halloween pins or to make into a necklace. Autumn-lovers of all ages will be delighted by these easy crochet designs. Size: Necklace Candy Corn: 1 1/4" x 1 3/4". Pin Candy Corn: 1 x 1 3/8". This towel topper combines crochet and plastic canvas into a darling turkey towel topper. Size: 7" across.